This week, we're taking a closer look at home values at Luxe condos by Menkes in North York. Located just north of Finch Ave at 5791 and 5793 Yonge Street, these two high-rise towers offer residents a range of building amenities, including a fitness centre, indoor pool and party room. In the past three months, four units were reported sold at at Luxe, from $259,000 for a 1-BR unit to $457,000 for a 2+Den suite. During this time, nine units were also leased with units commanding monthly rents from $1,350 for a 1-BR unit to $2,150 for a 2+Den suite. For more information on Luxe condos, please click here. This week, we're taking a closer look at home values at Yorkville's One Bedford condos, completed in 2010 by H&R and Lanterra. Conveniently located at Bloor Street, just west of Avenue Road. As its name suggests, this luxury high-rise is conveniently located at 1 Bedford Road - where Bedford meets Bloor - and offers residents a range of fine amenities, including a swimming pool, fitness centre, party and billiards rooms and an outdoor terrace. In the past three months, six units were reported sold at at One Bedford, from $530,000 for a 1+Den unit to $1,940,000 for a 3-BR suite. For more information on the One Bedford condos, please click here. 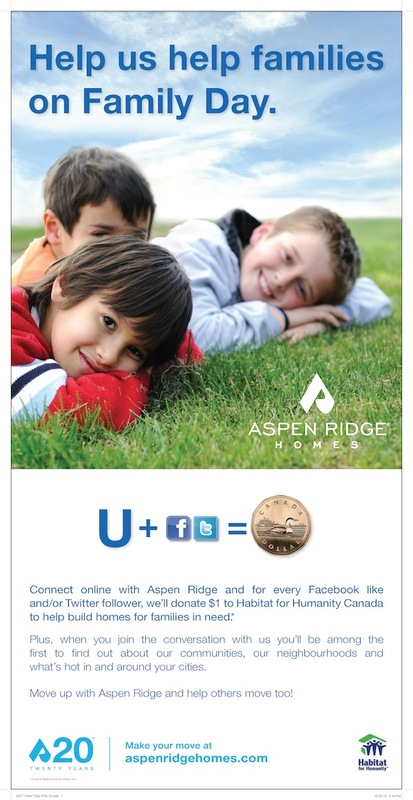 This weekend, help support a good cause and connect online with Aspen Ridge - $1 will be donated by Aspen Ridge to Habitat for Humanity Canada for every new Facebook like and/or Twitter follower on their pages. Help build homes for families in need! This week, we're taking a closer look at the Residences of the World Trade Centre, located in Toronto's lovely Harbourfront. Located at 10 Yonge Street (Phase I) and 10 Queens Quay (Phase II), these high-rise towers offer residents a wide range of amenities including a 24/7 concierge, a fitness centre, squash and basketball courts, indoor/outdoor swimming pools and a unique party room dubbed the 'Skylounge' on the penthouse level. In the past three months, six units were reported sold at the WTC Condos, from $229,000 for a 1-BR unit to $540,000 for a 2-BR suite. In this time, 10 units were also reported leased, from $1,250/mo for a studio unit to $2,980/mo for a 2-BR suite. For more information on the Residences of the World Trade Centre, please click here for Phase I and here for Phase II. The Canada Mortgage and Housing Corporation (CMHC) has just issued their first quarter Housing Market Outlook for Canada. The outlook expects the Canadian housing market to remain steady in 2012 and 2013, with the assumption that the Canadian economy will expand at a moderate pace and mortgage rates will remain low. Luxury Yorkville Living for Less? We all know that living in Yorkville comes with a premium. It's not unusual to find new condo developments priced well beyond $1,000/sq ft, and the market doesn’t seem to show any signs of slowing down. So, are these skyrocketing prices justified? Ask any realtor and they'll tell you it's all about “Location, Location, Location.” Yorkville is, after all, where the stars come out to play -- if you want to share the same sandbox, you'll pay a premium to do so. But, other than the off-chance of rubbing shoulders with the Brad Pitts and George Clooneys of the world, what "premium" features and amenities are you really paying for? Let's take a look at some of the most popular new condos as a point of reference. A doorman will greet residents at Four Seasons Residences. Four Seasons Residences, The St. Thomas and 77 Charles all offer future residents both a valet and doorman. In fact, The St. Thomas will even indulge its inhabitants with a convenient hall porter. Units in any of these buildings come with, at the very least, gourmet kitchens that will make you feel like a celebrity chef and luxurious, spa-like bathrooms that will make you never want to leave. These are exactly the kind of homes that make for the perfect stay-cations. So, what If you can’t justify the $1,000+/ sq ft price tag, but still want to live the "rockstar" lifestyle? Take a closer look at some of the nearby developments and you'll find that just a few minutes' walk can save you $100,000's. Consider for instance, Chaz Yorkville. Located just south of Yonge and Bloor, this more reasonably priced building is available for as low as $700/sq ft, with some unique amenities to boot. Facilities will include a state-of-the-art computer gaming arena, a self-service pet spa that will allow residents to pamper their pooches in style, and not one, but two theatres (including a 3D Hollywood-style screening room). A signature two-storey Chaz Club on the 36th and 37th floors is sure to be an entertainer's paradise, overlooking the lake and downtown skyline. Alternatively, head over to One Bloor at Yonge and Bloor, and you'll find units starting around $700/sq ft. This price point will get you beautiful, contemporary kitchens and baths as well as direct TTC subway access. Some of its unique amenities include several hot and cold plunge pools, a year-round indoor/outdoor pool and fireplace features within over 46,000 sq ft of indoor and outdoor amenity spaces. Yet another option lies at U Condominiums near Bay and Wellesley, where prices start in the mid-$700/sq ft range. Residents of each of its two towers will enjoy their very own 4,500 sq ft penthouse amenities area with wraparound balconies and picture-perfect views. Yorkville living certainly comes with a premium, but not without a few comparable alternatives that may prove more affordable, while still providing a competitive selection of premium features and amenities. Interested in this neighbourhood? Explore condos in Yorkville and its surrounding area here! This week, we're taking a closer look at Monarch`s Quay West at Tip Top in downtown Toronto's waterfront, near Lake Shore and Bathurst. In the past three months, five units were reported sold in Quay West at Tip Top, from $350,000 for a 1-BR unit to $742,000 for a 2+Den suite. In this time, five unit was also reported leased, from $1,100 for a studio unit to $2,100 for a 2-BR suite. For more information on Quay West at Tip Top condos, please click here.